Tradewinds Antiques was founded by Nancy Taron in 1979. With no specific specialty, Tradewinds sold China Trade porcelains, Federal country furniture and silver, and was rather eclectic in its offerings. In 1983, Nancy and her husband Henry discovered antique walking canes and acquired their first from a general antiques dealer on Cape Cod. Almost immediately they were captured by their appeal and were pleased to discover that no dealers were exclusively specializing in antique walking sticks in America. Canes had been increasing in popularity with antique collectors in Europe for several years and although written resources were sparse at the time, the Taron’s began learning all they could about antique canes through available books, by visiting museums and by developing relationships with other dealers in England and France. Henry left the corporate world in 1993 to join Nancy full time at Tradewinds. That year, they organized an International Cane Collectors Conference held at the Samoset Resort in Rockland, Maine. As a highlight of that conference, Tradewinds conducted the first auction ever held in the United States exclusively dedicated to antique walking canes. Since then, Tradewinds Antiques has held over 40 bi-annual live auctions on the North Shore of Massachusetts. In 1993, the Tarons asked noted Maine auctioneer Bruce Gamage to call their first auction. Since then, Bruce has called every one of Tradewinds live auctions. Additionally, four generations of the Gamage family work on the staff of each Tradewinds live auction. In addition to live auctions, Tradewinds has conducted over 30 internet-only auctions using their own internet auction facility at tradewindsantiques.com Tradewinds holds the distinction of being the first company in the world to present all-cane auctions exclusively on their own website with the first sale being in 1999. After organizing the first International Cane Collectors Conference in 1993, Tradewinds hosted a second conference in historic Salem, MA in 2000 with many events coordinated with the Peabody Essex Museum. Henry and Nancy always envisioned that organizing such events should be the purview of collectors and not the trade. At a third conference in Atlanta, Tradewinds turned over the reins of the conference series to the cane collecting community. Since then, committees of collectors have continued on to organize additional conferences in California’s wine country in 2006, Paris, France in 2008, Milano, Italy in 2010, and Chicago, Illinois in 2012. Tradewinds tragically lost its founder Nancy in 1998 in an auto accident. However, another generation joined the company in 1999 with the addition of the Taron’s son, Dr. Christopher Taron. 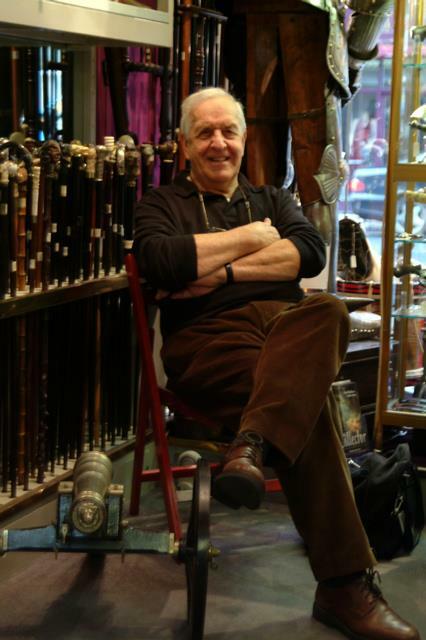 Chris is a very knowledgeable cane specialist in his own right with a particular passion for researching early American canes with historical ties. He is credited with discovering evidence that drawings of the influential 19th Century illustrator Thomas Nast inspired the design of Tiffany’s famous silver eagle canes. Recently, Tradewinds celebrated its 20th year of antique cane auctions and was invited to hold its 2013 Fall Antique Cane Auction in conjunction with the International Cane Collectors Conference in Chicago, Illinois. Over these past 20 years, Tradewinds has had the privilege of selling pieces from some of the finest collections in the world including remarkable canes belonging to Royalty, US Presidents and famous individuals like Charles Dickens. As the popularity of collecting antique walking sticks continues to grow, Tradewinds pledges to remain committed to the cane collecting community. Tradewinds is proud to have earned the trust of both consignors and buyers and is dedicated to being “America’s premier cane auction house” for many years to come.